Such fun colors. I like the way you’ve mixed a touch of pale pink with the oranges. It’s so unexpected. Thanks Marian, I am happy that you like the combination. I think the oranges show that there is actually an orange tone in the pink of the rose which I had not noticed before. Such generous, lovely blooms. I like the orange theme. Thanks! The theme was not at all thought about it, just the blend of tones that came together this morning once I had collected the perkiest looking flowers. 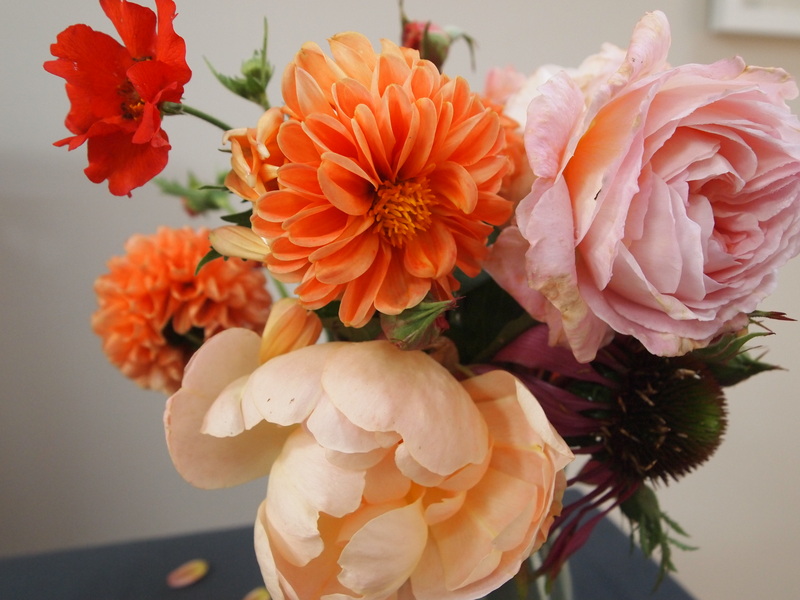 Fabulous peaches and oranges and love all those dahlias…I agree the petals fall faster now when I bring the flowers inside. Just a bundle of joy..you’ve picked some great coloured blooms, and once arranged and brought inside, on a day like today, they help to push the dreary weather away. Thanks Noelle, they are cheery aren’t they. 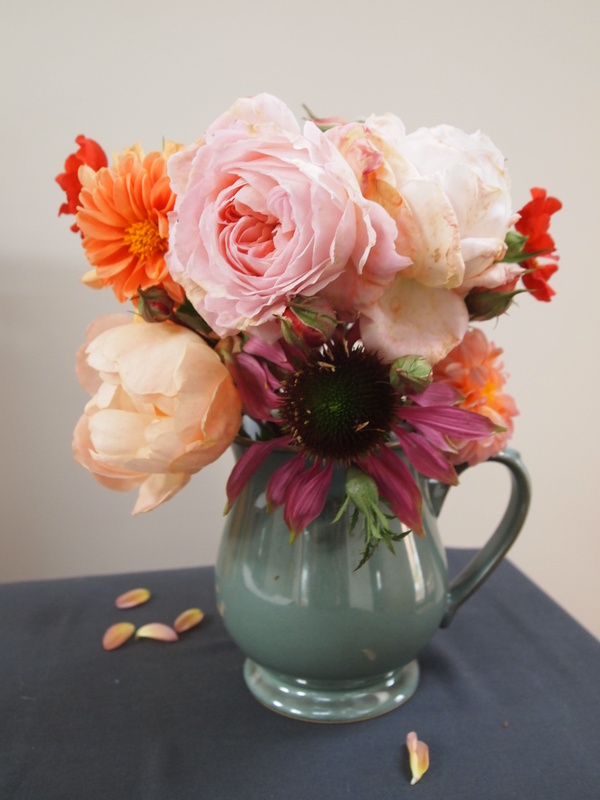 Thanks Cathy, those Geums have been amzing, they have flowered solidly since early May. We had thick fog here too and did not lift till gone 3. Your vase is lovely and cheerful and brings a smile too plus I really like when a few petals fall by the side of a vase, it all looks much more natural. Thnks Julie I am pleased it brightened your day.and today the fog is replaced by rain. The roses are incredibly beautiful. I’m in love the ‘The Lark Ascending’ rose, which I’ve never seen offered here – you can bet, if I ever do, I’ll snap it up. Echinaceas still in bloom, how lovely. I love the colour scheme of your arrangement and Lark Ascending is gorgeous. Thanks Chloris, I would have not chosen L A rose, it was a gift from a friend who was emigrating. It is possibly my favourite now as its form looks so delicate, it’s not, and the colour compliments pink tones and looks beautiful amongst Karl Foerster grasses. I would recommend if you have room. So cheery on a foggy morning! I do love your pink Echinacea – is it a reliable one? I only have one that comes up every year and any others I have planted just disappear over winter…. Hope you get some sunshine this week! Hi Cathy. It is just the standard purpurea one. I bought it as a root cutting and bunged it in. In my last garden they would last for a couple of years then disappear. I am on very heavy clay here so I just do not know how it will fare. Certainly it has grown really well so far. As to sunshine, the fog has gone been replaced by heavy rain. yuk. I like all the bright pastels together, the roses and dahlias are lovely, Dorris. My Echinaceas were done a long time ago. The dark reds are so gorgeous together. Hello Hannah and thanks for your kind comments. 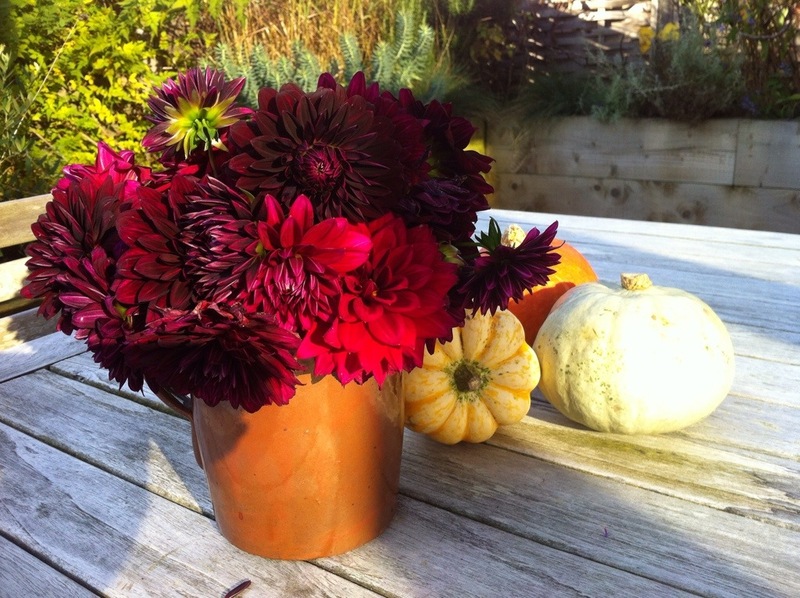 The dahlias have been amazing this year and already I am planning which ones to have next year. I am hoping the Echinaceas survive the Winter as they are a joy.